What is yogurt? Simply, yogurt is curdled, separated milk. The fat that is usually dispersed in droplets with in the milk, become captured by unraveled protein chains creating a thicker and clumpier milk product we call yogurt. How does this happen? Remember those microbes we were talking about? They are lacto and bifido varieties and these little bacteria acidify the milk. The first yogurt discovery was likely an accident. Today yogurt is produced with large industrial methods and can be purchased in your local grocery store. But remember, not all the yogurt you can buy is packed full of beneficial gut bugs. A lot of the flavored processed varieties are full of sugar and chemicals and don’t offer the full benefit for your microbiome. I recommend you try Organic Plain Greek yogurt to get the full benefit of these super gut bugs. If you need to sweeten it a bit, try a drizzle of maple syrup or raw honey. Probiotic (pro meaning “for” and biotic meaning “life”) foods have been eaten for centuries and have been proven to deliver the important gut supportive microbes through our acidic stomach and into our intestinal system where they help digest our food and improve the absorption of essential vitamins and minerals. These little bugs actually make some vitamins that our body’s need to work optimally! Lactobacillus rhamnosus – Studies suggest that these gut bugs may aid in weight loss, reduce the risk of developing allergies/sensitivities, help with stomach issues and may even reduce the risk of contracting certain viruses. Lactococcus lactis – Studies suggest that this species may aid in the treatment of antibiotic -associated elimination issues such as diarrhea. They may even help with infections that create this same problem. Lactobacillus plantarum – Studies suggest that the toxins that these bacteria produce may have antifungal properties and may reduce the symptoms of irritable bowel syndrome. Lactobacillus acidophilus – Studies suggest that this species could be important to ward off traveler’s diarrhea and show anti-fungal properties. Bifidobacterium bifidum – This species is one of the first to populate the gut of newborns. Studies suggest that these gut bugs can help reduce diarrhea in young children and help with the reduction of cholesterol levels. Bifidobacterium animalis lactis – Studies suggest that this strain may help with constipation, they may help with dental plaque, reduce upper respiratory illness and reduce total cholesterol. DID YOU KNOW? The 100 trillion bacteria in your gut outnumber the cells of your body by 10 to 1. Want to get even healthier? 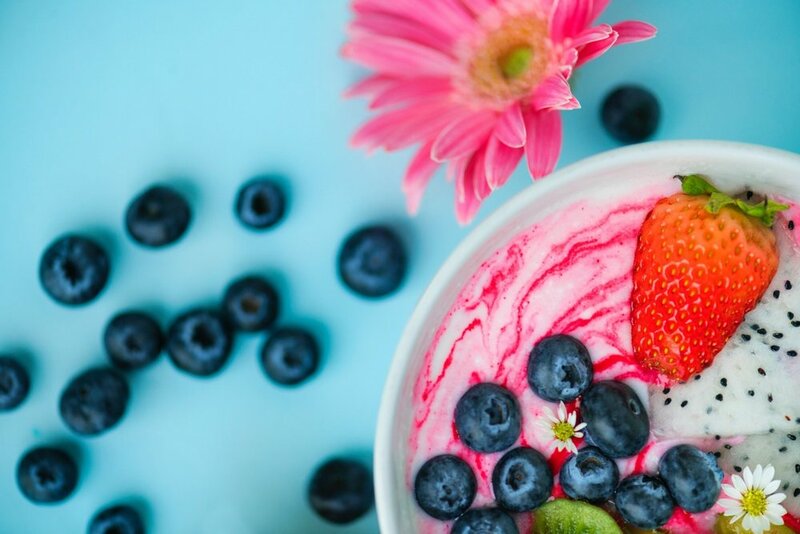 If you’re looking to introduce yogurt and more probiotic foods into your diet – in a way that’ll help you improve your health, appearance, and performance, let’s talk! Schedule an initial complimentary consultation with me today—or pass this offer on to someone you care about! Visit www.noshoesnutrition.com and sign up for a FREE consultation. I work with people from all over the world individually or in groups so don’t let anything hold you back!